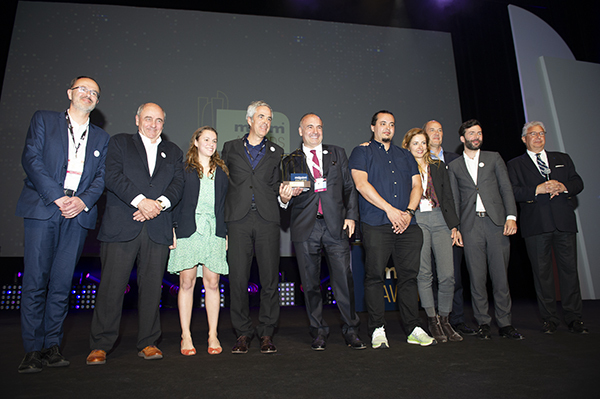 Mille Arbres, jewel of green urbanism signed La Compagnie de Phalsbourg and Ogic, won the MIPIM Award 2019 in the category “Best Futura Project”. The trend of innovative architectural achievements is mixed use and the integration of a large part of vegetation in buildings focused on sustainable development. 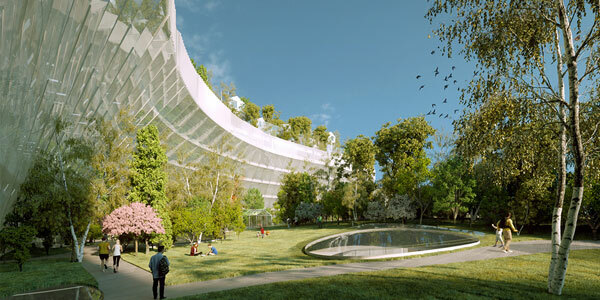 Designed as a real building-city, Mille Arbres (Thousand Trees) will house offices as well as housing, a four-star hotel, a panoramic restaurant, a playground for children, two nurseries… Planted with a thousand trees, the vertical city that won the MIPIM Award 2019 category “Best Futura Project”, will be realised Porte Maillot on the horizon 2022. 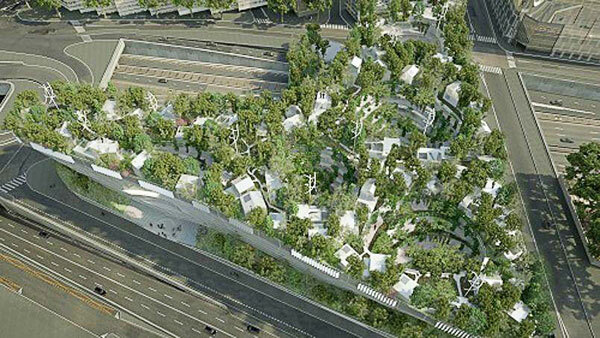 Instead of aiming for architectural heights to compete with the Tower of Babel, Mille Arbres dares another model of urban development: planting 1000 trees over the périphérique (ring road). 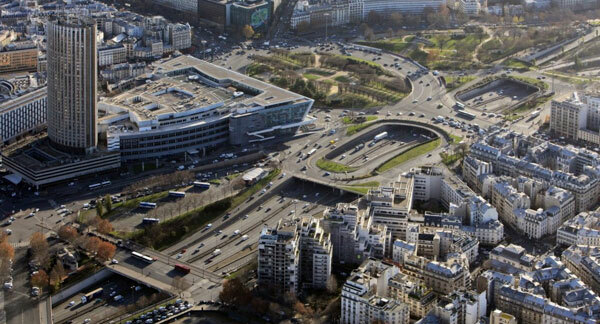 To replace the boundary the ring road represents, La Compagnie de Phalsbourg and Ogic have imagined Mille Arbres as a public course, a forest housing residential and office buildings, a hotel, restaurants, a large pole dedicated to children, a road station, the whole in a unique place giving room to the vegetation for more conviviality, social link and nature well-being. The Mille Arbres project was born from the imagination of architects and designers from two architectural firms, one Japanese, the other French. The first, Sou Fujimoto Architects, has an in-depth continuous reflection upon the relations between the Man, the building and the Nature, between nature and architecture. 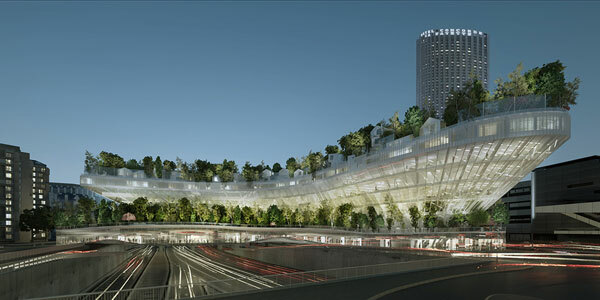 The second, Manal Rachdi-Oxo Architectes, is a young Parisian agency, which also sets nature in the heart of the city. Together, they worked to give the west of the capital a new skyline. 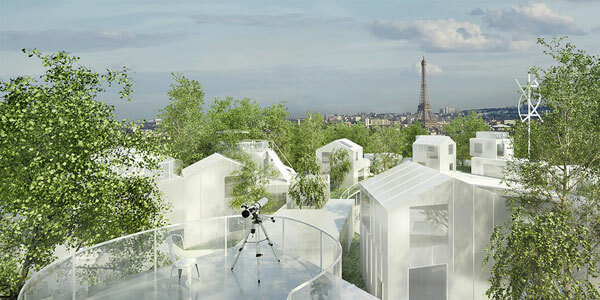 “With its village and its inhabited forest, Mille arbres offers a new “green skyline” for Paris” (Sou Fujimoto and Manal Rachdi). Mille Arbres is a bit like a dream, a floating village in the middle of a forest, an abundance of vegetation in Paris, a public park where one can regain a sense of calm, in a cool atmosphere. The project includes 30,000 m2 of offices divided between two independent buildings, 130 housing units with a communal garden terrace and a common outdoor kitchen, a 250-room 4-star hotel, all served by an ultra-modern road and bus station. The gourmandise will have its place with the “rue des chefs” housing a new generation Food Court, created by Philippe Starck, with a place dedicated to guests tables, workshops or a dietetic cooking school. Mille Arbres offers a childhood center consisting of a large indoor playground, workshops on the theme of biodiversity with initiation to beekeeping, gardening, botany or the construction of huts made of recycled materials, two cribs of 60 cradles, and a day-care center. Parisians and tourists from all over the world will be immersed in a refuge environment of biodiversity, unparalleled in an urban environment. As guarantor of the thus created ecosystem, the park will host the Maison de la Biodiversité (House of Biodiversity), managed by the League of Bird Protection (LPO) where educational workshops will be given. In addition to the Biodiversity House, the park will also house the Maison du jardinier (Gardener’s House). 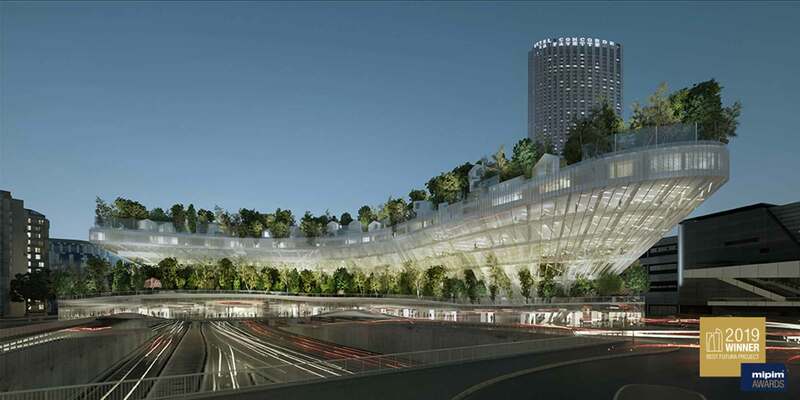 Thousand Trees has earned the Compagnie de Phalsbourg and Ogic the MIPIM Award 2019 in the category “Best Futura Project” on March 14 at MIPIM in Cannes.